This was dinner for hubby, the two boys and my domestic helper. 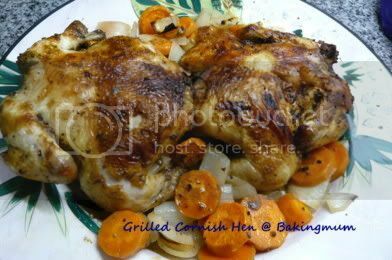 Grilled cornish hen with onion and carrot. All said the hen tasted good. 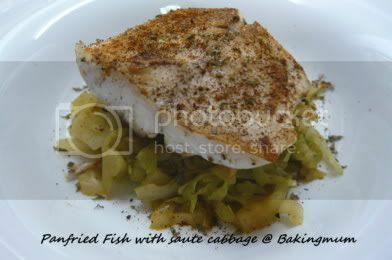 Panfried fish with saute cabbage. 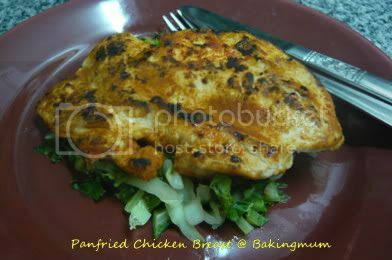 Panfried chicken breast coated with curry and chilli powder and salt on a bed of saute cabbage and baby kailan. I'm so hungry right now and looking at your delicious meal make it worst. 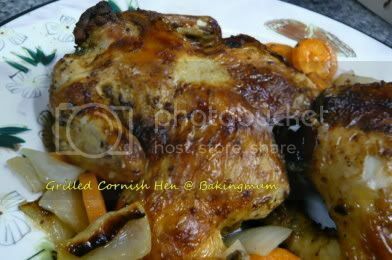 I love cornish hen and oh man, I'm so hungry! I haven't had a cornish game hen in such a long time. My mouth is watering just looking at your gorgeous photos. I have just tagged you on my blog. (like a tagging of 7 other pple chain) Brings more pple to your blog and thereafer. Have fun! Thanks TB. How are you. Have you been cooking lately? Hope this note finds you well. Have not heard from you since.